30 days in Monsoon season with an old Nissan van. Welcome to Rip Curl Projek Monsoon The Art Of Getting Lost. You might be wondering why monsoon got to do with Nissan van. Ok, Projek Monsoon is supported by Rip Curl Malaysia, a 30-day journey of five guys who took a break from their chaotic jobs to live their passion: surfing. OMG this is so cool. I am inspired by the Projek Monsoon, I wish that I can leave my permanent job and go travel plus do the things I am passionate about. Ok, back to Projek Monsoon, these 5 guys are equipped with only bare necessities and riding an old Nissan Vanette Datsun C20, their mission was to catch and crash the waves along the east coast of peninsular Malaysia. 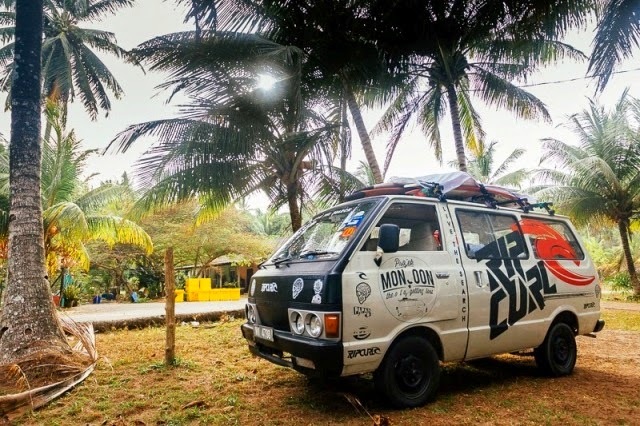 30 monsoon-filled days of living with each other on the road, camping underneath the trees, by the beach and the roadsides, Projek Monsoon documents the determination of a group of friends who turned a vision into a once in a lifetime experience. Projek Monsoon is backed by world’s top surfing company, Rip Curl, whose philosophy is ‘Live the Search’, which expresses a relentless need and thirst to feel the freedom and energy of the oceans, of travel and adventure. With this, Rip Curl Malaysia hopes to inspire more people to take a step in fulfilling their personal quest. To celebrate this extraordinary surf roadtrip project, Rip Curl Malaysia has released limited edition Projek Monsoon t-shirts that are available at major Rip Curl stores in the Klang Valley starting April 2014 onwards. The tees come in three different designs priced at RM99 each.